Originally released on the Playstation and Arcades during the Street Fighter 2 craze, Super Puzzle Fighter 2 Turbo came to make us all out of breath with its long name but also entertain with it's surprisingly fun gameplay. I remember playing it constantly back in 'the day'. Such a shame I have to call that time as it is but whatever. 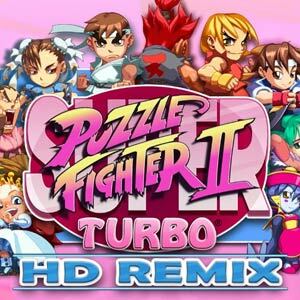 Capcom much later decided that we needed a longer name with a huge visual upgrade with Super Puzzle Fighter 2 Turbo HD Remix. You may breathe now. Puzzle Fighter's gameplay is simple. You move and drop pairs of differently colored blocks. When you get four of them together or more, they from a much larger block. You use these trippy orb-like items that randomly appear with a block to break the blocks of its corresponding color when it comes in contact with that color, this will break the blocks it comes in contact with and any it is connected to, again, if it is the same color as the orb. One thing that makes this a bit different though, is it uses characters from the Street Fighter and Darkstalker's fighting games and once you break blocks, you will then drop blocks onto your opponent! This makes it feel a lot like a fighting-puzzle game especially thanks to the animations that play out as you 'attack'. The gameplay here is addicting thanks to the very fun combos and chains you can create, pummeling your opponent after making a huge chain of blocks. Each of the fighters have their own unique drop patterns and this is one of the better aspects of the game. While some patterns are better than others, each one feels unique and adds a bunch of replayability to a game that already plays pretty well. The modes in the game also change this up. You have the new X' mode, which changes some of the fighter's drop patterns to be a bit more competitive, X mode which has the original drop patterns, and Y & Y' modes which are variations of the gameplay. The main meat of the game is in the X modes as they are the standards and the most fun. The Y modes, which have you breaking blocks in very weird ways, feels tacked on and I honestly never played much of them. I doubt many play these regularly. 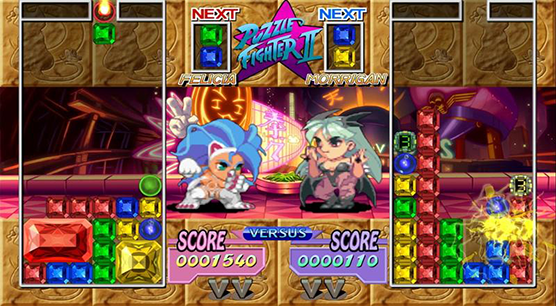 Each of these four modes are also like the standard arcade mode, where you go through the fighters until you beat the boss. There is also an online mode where you can play against other players in ranked and non-ranked play. This is what you would expect, it's Puzzle Fighter online! This obviously not being in the original makes this a pretty interesting addition and it works well, though it is pretty standard fare. My one gripe beyond the lack of features, is the occasional online lag. While it never completely hampers the gameplay, at times it can make some of your block movements be delayed which can really mess up a specific strategy that you were aiming for. Beyond that there is not much else to say about the online, it is very standard, but it works. One of the biggest additions to this version obviously are the revamped HD visuals. The art style and graphics have been completely overhauled for most of the game, especially for the blocks and visual effects and it shows. When played on an HD display, the colors are far more vibrant and pop out way more than the original. Even the sound is vastly improved! This definitely puts this game far beyond the original in the graphics and sound area. My one gripe here though, are the character sprites. I am sure there was a reason behind this, but for some reason the character sprites did not get the same visual upgrade, they are actually the same sprites from the mid 90's essentially.  This makes them look kinda fuzzy and quite out of place in comparison to the rest of the eye popping visuals. Another thing I want to mention is in my opinion a decently huge addition to this Remix, the ability to press Up on the controller to instantly drop your current block. In the original game, you could not do such a thing, you had to hold down in order to drop the blocks and it dropped at a standard pace. Here, you can press down but now pressing up will instantly drop your current block. This makes for some really intense and much faster gameplay when this is mastered. I found that to be one of my favorite additions to this game and I am happy it was made. Going back to the original felt so much slower in comparison. One last thing, this remix is missing the unlockables from the Playstation version, for reasons beyond me. This game could have used something like this because while the gameplay is very fun and replayable, it does lack in content overall. I want my sound clips and artwork! 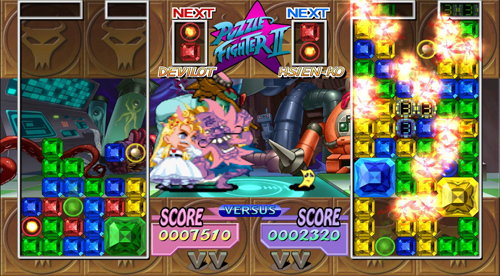 Super Puzzle Fighter 2 Turbo HD Remix *breathes* is a solid remake of an already solid puzzle fighting game. It's touts the same addicting gameplay but adds new modes and very dazzling visuals with online play to boot. While some of the modes are lackluster, the gameplay holds the game up in replayability and fun especially so because of the different characters. The new control methods are also a big improvement. Despite some odd looking character sprites and a noticeable lack of content, this is a puzzle game I keep going back to again and again. If only I could unlock something in the game for that. 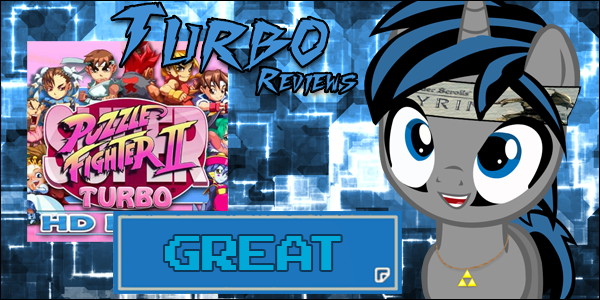 If you enjoyed this review, be sure to follow Turbo Reviews for notifications on every new review! Hmm, interesting, are there any other fighting games you would recommend, Kyoshi?